DESCRIPTION – This Fall Dried Pink Bell Flower silk flower spray has an overall length of 29 inches, an 11.5 inch stem, 10 flowers with a 1.5 inch diameter, 2 buds and 6 wired leaves. DESCRIPTION – This Yellow Flocked Statice hand wrapped silk flower has an overall length of 19.5 inches and a 10 inch stem. 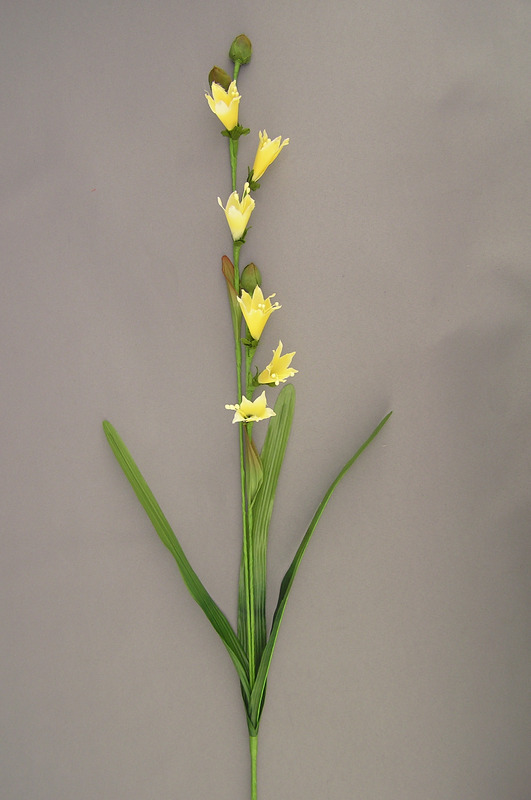 DESCRIPTION – This Golden Yellow Freesia handwrapped silk flower has an overall length of 30 inches, a 10 inch stem, 6 flowers with a 1 inch diameter, 3 buds and 3 wired leaves. DESCRIPTION - This Yellow Rose Bud hand wrapped silk flower has an overall length of 22.5 inches, a 6.5 inch stem, 4 flowers with a 1 inch diameter and 3 wired leaves. This artificial rose is the perfect flower for weddings, everyday arrangements, and other special events! DESCRIPTION – This Yellow Carnation hand wrapped silk flower has an overall length of 23.5 inches, a 14.5 inch stem, 3 flowers with a 2 inch diameter, 2 buds and 7 leaves. DESCRIPTION -This Golden Yellow Daisy hand wrapped silk flower has an overall length of 3 inches, a 13 inch stem, 8 flowers with a 2.25 inch diameter, 2 buds and 4 wired leaves. $1.29 ea. $0.903 ea. $0.774 ea. $0.645 ea. $0.581 ea. $0.548 ea. $0.516 ea. $0.484 ea. DESCRIPTION – This Yellow hand wrapped silk flower Daisy spray has an overall length of 24 inches, a 6.75 inch stem, 2 flowers with a diameter up to 4.5 inches, 1 bud and 8 wired leaves. DESCRIPTION - This Yellow Daisy hand wrapped silk flower has an over length of 17 inches, an 8 inch stem, 3 flowers with a 3 inch diameter, 1 bud and 5 wired leaves. DESCRIPTION - This Candle Glow ( Candlelight ) Tiger Lily hand wrapped silk flower has an over length of 38 inches, an 18 inch stem, 2 flowers with a 7 inch diameter, 1 bud, 4 blades of grass and 4 wired leaves. DESCRIPTION - This Sunglow ( Light Peach ) Lily hand wrapped silk flower has an overall length of 32 inches, a 15 inch stem, 5 flowers with a 1 3/4 inch diameter, 5 buds and 13 wired leaves. DESCRIPTION – This Candle Wheat Grass hand wrapped silk flower has an overall length of 34 inches, a 15 inch stem, 9 blooms with a length of 4.5 inches and 3 wired leaves. DESCRIPTION - This large single Yellow peony has an overall length of 23 inches, a 13 inch stem, one flower that measures 4.5 inches across and has 2 wired leaves. DESCRIPTION - This Butterscotch ( Orange Tangerine ) Lotus Blossom silk flower has an overall length of 17 inches, an 8 inch stem, 2 flowers with a 2.75 inch diameter and 4 leaves.